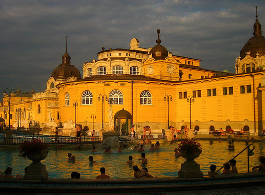 Book a single Taxi Transfer from your accommodation to Szechenyi Baths to have a peace of mind for a better thermal relaxation. 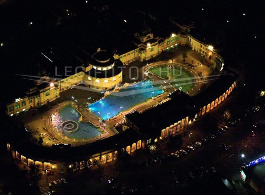 Taking a few laps in the swimming pool or resting in the healing waters of Szechenyi Baths can be weary, so why not arrive or leave in comfort sparing your energy and choose a professional taxi transfer service from your address in Budapest to Szechenyi Thermal Baths. Hotel drop off after the Bath visit is not included. You can add your preferred pickup time in the booking form on the left. 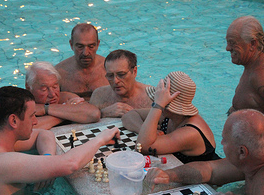 Check-in for online reservations is available from 9 am to 6 pm at the Help Desk of Szechenyi Baths. If you booked a massage treatment in Szechenyi Baths, please make sure to arrive at the Baths min. 1 hour before the massage hour, so that you can be ready in swimwear by the time the massage hour begins. 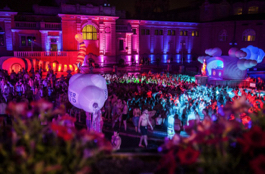 For instance, if you have a massage at 11 am, check in is at 10 am, and you would want to have a taxi ideally at your hotel reception by 9 am to get to the Spa from any part / district of Budapest well in time. 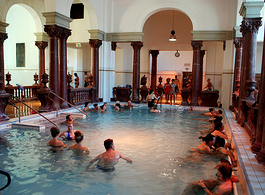 Szechenyi Thermal Baths is not only one of the largest spa complexes in Europe and the most well-known thermal and public bath of Budapest but also a perfect place to relax in one of the 18 pools, 10 saunas / steam cabins or just enjoy a well-deserved massage therapy or a luxury facial treatment. 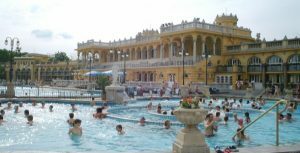 Do not waste your time travelling by public transport when you can spend a whole day at Szechenyi Baths with a valid entry ticket. Please note that this Taxi Service can be booked by daytime baths guests only (until 5 pm), and it is not available for Sparty goers. Thank you for your understanding.